ExtraDigital designed the website for We Do Recover, the website design itself replaced the previous website which was a very basic article looking website and certainly not fit for the direction in which We Do Recover wished to head, nor to attract the clients that they wished to attract via their website. They approached us stating that they wanted their website to look professional and capable, just like the services that they offer. The focus was to include more images of people looking happy, content and enjoying life free of the burdens and pressures that many of their clients feel. To make the website more appealing and inviting to visitors we changed the colour scheme of the logo to give the brand and the website a more health and recovery feel. 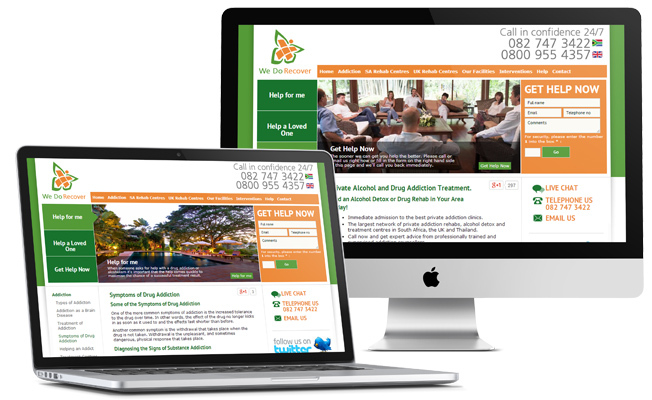 When designing the website for We Do Recover we considered the various paths in which visitors to the site would travel and the path that they would take when on the site, each path way needed to be simple and easy to use so that it benefited We Do Recover themselves as well as their clients. The content and the menu used needed to direct people to the information that they wanted in a quick and swift manner to make their experience on the site mirror the services offered by We Do Recover. We also gave the site a clearer call to action feature on the home page which enabled people to get in touch in trouble-free and effortless manner. Like every website that we design, we ensure that the design is unique and attractive. We pride ourselves on our ability to design and develop search engine friendly websites so that the website design works with the functionality and the future marketing of the site. Our client is very pleased with this website design that we created and has been the improvement in the number of people that they have attracted and therefore been able to help. You can view this website design and many others that we have created over the previous years on our website in our portfolio. On our site you can also read the many testimonials regarding our services and work quality that our clients produced. To find out more information about website design and branding services that we can offer, simply contact a member of our team on +44 (0) 1227 68 68 98 today.